You must do your research and choose your career path. You must do your research and choose your path. Make a compelling argument for it with your parents – they don’t always know best and are afraid for you! 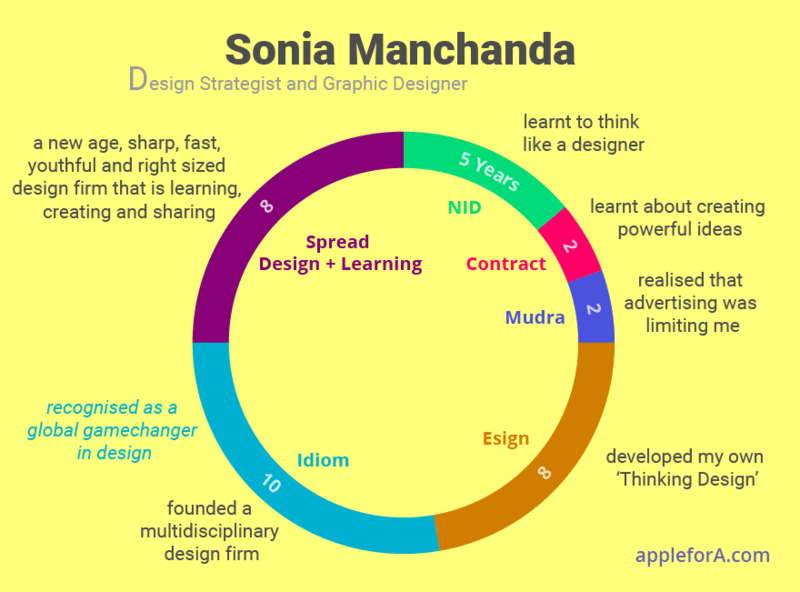 I am Sonia Manchanda, a Design Strategist and Graphic Designer with 20+ years experience in building creative organisations, training and leading interdisciplinary projects as well as teams on massive transformational projects nationally and globally. Do check out my Open Innovation and Design Strategy Project Dream:in which has been awarded a global game changer by Metropolis Magazine, USA. I am also the Founding Partner at Spread Design + Learning. My mission has always been to spread design as a way of thinking and doing things. Besides, I am a graduate of the National Institute of Design, Ahmedabad, an appointed member of the India Design Council and a Governing Council Member of KCT’s Incubator Forge at Coimbatore. Apart from that, I am on the CII National Design Council and a Trustee with Nrityagram, the dance village. My work involves designing systems that bring about positive change, create sustainable brands and unique experiences besides building capability and capacity by designing, learning systems. Who is a Design Strategist? There is a constant friction between change and continuity. Entrepreneurs, businesses, philanthropists and those in public office are all drivers of change. A Design Strategist is a catalyst who can understand, connect, see beyond what is and articulate what can be. While other types of consultants can also possibly think well and articulate equally well or better – a design strategist is uniquely positioned to shape a tangible and holistic system and solution. This can be brought alive as a product or systems of products, from a business or social perspective. Therefore, creating new value while creating a whole new human experience, thereby creating fresh meaning. All the while, enabling a smoother and faster transition towards a future that seems in equal parts is exciting and natural. A good design strategist can be the guide and catalyst for the quest to see the future of humanity and get there faster and in a way that’s efficient. I have always been an optimistic, driven and thinking person. So, while I was preparing for a future as a doctor (both my parents are doctors, I was always my father’s girl and this is what he wanted for me); I was involved in all sorts of other creative things like leading up the school magazine, clubs, sports and I was the head girl of the school. Although I didn’t know them as being creative things then. A friend who applied for NID and became completely befuddled by the place (engineer type – why am I not surprised ☺) ‘felt’ (he actually ‘felt’ ☺) that I must visit and think about it. One visit and I thought that I would die if I didn’t get in there. The rest happened very naturally and easily – I grinned through the exam, interview and everything else and I knew one hundred percent that this was my future, even if design had no clear definition, role or use in the country then. What is the story behind Spread Design and Learning? How did it all get started? I left advertising because I knew very quickly that was not what I wanted to do and set up Esign, to work on the twin ideas of design and sustainability. Esign gave me the opportunity to develop my own ‘Thinking Design’. Twenty years ago, we wore sweatshirts emblazoned with THINKING DESIGN. As the team that grew around me, I felt that it was our way of thinking that gave our craft a much deeper punch! As we grew, we did bigger and bigger things – we made a film that ended with the conviction and line – ‘we are a small place, we do big things’. People wondered about this ‘Esign’ place that was all about a garage office, some dogs and just a few ‘designers’! Note: Esign created the brand ‘Manipal’, the design system that was ‘Bangalore Forward’ and the start of modern retail in India that was ‘Big Bazaar’ and ‘Central’. Amongst many many other things. We were drawn to the idea of creating a large design enterprise for India, which was Idiom. Ten years was dedicated to Idiom by the core team of Esign and the rest of the Idiom team and partners. When it started to feel like this was not our likely future, philosophically and practically, we felt that it was time to get a fresh start. So, after giving Idiom all that we could possibly give; we returned to the farm studio that we had abandoned. To set up Spread Design + Learning. A new age, sharp, fast, youthful and right sized design firm and collective. That integrates new technology and learning with design. On a sustainable farm. Our core team has loved this opportunity to start afresh and we hire very selectively. Each person pulls their own weight, is independent and yet backed by the might of our collective experiences. I design. Period. It may be manifested as stories, as systems, as brands, experiences, as a learning product, as an open innovation system and as a living experience. Or even just an idea that is compelling. Who I am, why I think, what I feel for is all expressed as design. I hope that I influence younger generations around me to think in ways that are game changing and fresh, be mindful of details, to focus, to be resilient. Bruce Nussbaum mentioned to me once that we in India are lucky because we still have a making culture. I was a bit surprised but when you think about it, yes we do make our bread fresh everyday, the kitchen is a virtual workshop, we have craftspeople. But professionally, we have let ourselves down on that score. We have no making and no culture. We have to teach ourselves afresh everyday, to create beautiful new stories, imbue them with quality and detail and revisit and revive a culture that will be unique to a new India. My work involves designing systems, creating sustainable brands and unique experiences besides building capability and capacity by designing learning systems. Bruce Nussbaum, former assistant managing editor for BusinessWeek, is professor of innovation and design at Parsons School of Design and an award-winning writer. When you are around people you trust, who share your deep conviction about the sheer power of design and are willing to dig as deep as is required to find that glittering gem of possibilities – what is there to not love! What are the challenges you face in your career? We work on bigger, tougher challenges now where the control on the outcome is not necessarily in our hands. Especially in a time when industries and governments globally are themselves uncertain about when is the right time to do what. Despite our best strategies and efforts, things don’t always work out ‘perfectly’! Developing an even deeper understanding of the underlying causes and influences, being ever more aware, having a greater level of ingenuity, greater tenacity and resilience…evolving mind and craft everyday – these are some of the challenges! Can you summarise your career journey? Five long years at NID learning to think like a designer, influences from the city – frugality and Gandhiji’s approach. Learning to take pictures, do great communication design and filmmaking. Two long years at Mudra Bangalore where I decided that Advertising limited me. Eight years of and as Esign that started with just me, a 386 PC, a table and a mattress on the floor. Dissolved into Idiom when we were 18 people, a couple of dogs, a farm studio and a husband who finally decided to quit advertising and use his amazing mind for better things. Ten years as CoFounder and Principal Designer at Idiom creating India’s largest independent design firm, training teams, leading projects. Highlights – bagging the Design and Look of the 19th Commonwealth Games; creating much of modern retail in India. Personal Highlight – Created an Open Innovation + Design Research Independent and Collaborative Project Dream:in that became a global movement of hope, optimism, innovation and change. Founding partner at Spread Design + Learning – Exciting journey where the possibilities are endless, the challenges big and the work super exciting. The fact that it’s on a farm where every single tree and blade of grass is planted by us reminds us everyday that when you sow great ideas you reap good results. What sort of experiences helped prepare you the most? Why not is a dangerous expression! There were several instances where I did something…big or took on an onerous responsibility or a challenge to do what had not been done before. Each of those experiences, while stressful prepared me for the next level. If you see your career as a game, as play, then you can’t repeat yourself, you have to want to get out of your comfort zone, be bold, think why not and that’s how you evolve. Running my own design company helped me understand the workings and nuances of business. Designing for the Commonwealth games made me teach myself, how to work with complexity and scale. Creating the Dream:in Project made me realize the power of a big idea and the power each one of us have within us to create an impact personally and globally. What are skills and education required to be a Design Strategist? A good design education creates the foundation. The design process, if learnt from masters, will guide you to start from deep exploration and insights. It will make you sensitive and mindful. Working on design projects which require a blend of skill and craft prepares you to have an outcome orientation, makes you realistic. An authentic Design Strategist has a genuine design background. Along with experience working closely with business or policy to create significant impact on multiple projects. Or then, training in Design Strategy / Advanced Design. The two best places I know of are Parsons / The New School / School of Design Strategies (that I have worked closely with) New York or the IIT Institute of Design, Chicago. When you hire someone what do you look for, apart from role specific qualifications? Intelligence. Curiosity. Independence. The desire to continuously learn, do and evolve. In any field, the only way to grow is to create, create, create. Some of your creations will work, some will not and that’s how you will learn and grow. There are some young people who are always looking for the easy way out – they ask seemingly intelligent questions but actually know very little about anything and when you give them something to do, they will, very easily come back and say, I am stuck. I look for people who want to use their own mind and not mine. Who’s hands are itching to do things. Your mind is visible in your craft. That’s such an amazing power to have! Design is a way of life for me. So, in my free time, I like to figure out fresher ways to enhance the quality of life. It may be through planting, growing and harvesting, cooking and baking or even watching the light changing and capturing pictures that tell a story. Culture is another passion and I like to explore places steeped in culture. I like reading fiction and nonfiction that explains the human condition and evolution. How do I know if a career in design is for me? Who should take up this career choice? Everyone is born creative so a career in design and at least an understanding of design is – for all! That you can apply in life or in your profession. Folks with leadership qualities, those with a desire to communicate, or others with a great interest in geometry, maths. If you can organize things into systems, if you can articulate your thoughts, if you can make things…design can be your career choice. Infact then, it will never feel like work – it’s almost addictive. However, being a good designer or design strategist is not an easy job due to the rigour it demands. Degrees don’t guarantee jobs anymore and the gap between formal education and industry is increasing drastically. In this scenario, what are some practical steps teenagers should take to prepare themselves for the future? So, here’s the good news about design. No one cares about your degree. Two things count. One. Your Portfolio that demonstrates your drive, your thinking, your craft – besides your successes and your failures. So, it’s what you know and what you can do that matters. The bad news though is that with changing technologies, your skills can become redundant unless you keep learning and evolving. There are enough resources available online for you to do that. Besides which, you need to be AWARE! Of technology, economy, ecology and sectoral trends. The learning can never stop – you have to stay one step ahead of your user, your client and the world. You are competing against yourself because when you are creating the future, your competition does not exist yet. That the professions that will define their work life do not exist yet. When I was in school, we thought that designers were people who made clothes and it was a not profession for ‘intelligent’ students. But I saw something there – perhaps a sign of things to come, like a few others who headed for places like NID. We live in a VUCA world (as is famously said nowadays) and things will keep changing. So, your starting point is you yourself and what you know you will be able to do best and what will propel you to get out of your comfort zone and realize your full potential. Stick with it. Tell me about an accomplishment that you’re most proud of? Well yes. What I am secretly proud of – is the fact that when I was studying design, my family wanted me to study in the USA / in Parsons. I was convinced that NID was perfect, besides I have a nationalistic streak. Flash Forward – with The Dream:in Project, I was able to create something that won me … and my collaborator from Parsons / The New School / School of Design Strategy a global gamechanger award. We were recognized as one of 6. It was a first for me and first for Parsons as well. Outliers. Gamechangers. Are the ones who shape our future, but they don’t know it when they are doing it, because they are doing something that’s out of the ordinary. So, the recognition is a great pause and a time to reflect and be pleased. Creative Action is the only way to respond when things are getting disrupted around you. Design as a method for creative action helps to make sense of things as they are and as they can be. With human beings at the center, in a meaningful and sustainable way. No wonder the next generation is attracted towards design. Whereas previous generations who were in the business of preserving status quo, don’t get it!